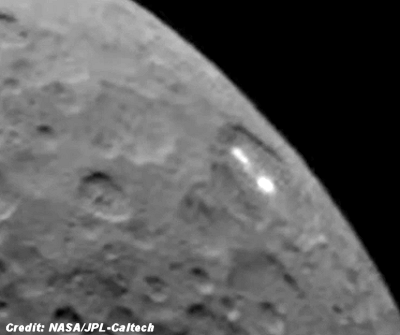 That bright mysterious spot on Ceres is still a mystery. And, although the source of this illuminated area has already been the subject of much speculation, NASA is now requesting public supposition. NASA’s Dawn spacecraft is in orbit around Ceres, the dwarf planet in the asteroid belt between Mars and Jupiter, which happens to be the largest body in that asteroid belt. Before entering orbit, Dawn photographed the planet, and those captured images reveal the strange illuminated area, which is actually composed of two bright spots within the same basin on the surface. Speculation about the source of these unusual lights began immediately after Dawn’s photos were published by NASA. Puzzled scientists suggested a volcano, or light reflections off ice or water vapor as possible explanations. And others offered up the possibility that this illuminated region could be an extraterrestrial civilization. The predictions continue to swirl. And, until Dawn can gather more data, NASA wants to know what you think is responsible for Ceres’ bright spot. . . .